New research suggests the sun is driven by the same mechanism as other sun-like stars, even though it has an unusual cycle. Is our sun fundamentally different from other "sun-like" stars? This question highlights an ongoing controversy about whether our nearest star is unique or, in fact, an "ordinary star." 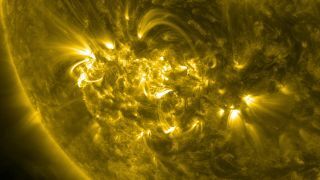 Now, an international collaboration of solar physicists thinks it has an answer. Although the sun is very special to Earth and all of the planets in the solar system, it isn't unique; indeed, it is driven by the same internal mechanisms as other stars, the researchers said in a statement highlighting the findings of a new study. At so-called "solar maximum," solar storms are commonplace, triggering many solar flares and coronal mass ejections, where plasma from the sun's atmosphere explodes into space. These phenomena are collectively known as "space weather" and can have damaging effects on unprotected satellites in Earth's orbit, cause communications blackouts and even overload power grids on the ground. Understanding the sun's magnetic cycle is, therefore, of utmost importance to space-weather forecasters hoping to better prepare our high-technology society for the potentially expensive damage that powerful solar storms could cause. Using a 3D computer simulation, the researchers modeled the sun's internal dynamo, which is the physical process that generates the sun's magnetic field. Located in the uppermost 30 percent of the sun's interior — a region called the convection zone — powerful flows of solar plasma (very hot gases composed of charged particles, called ions) dominate. As this turbulent soup of hot material flows, it creates powerful electric currents that, in turn, generate magnetic fields (via the "dynamo effect"), which float to the sun's photosphere and into the sun's corona (the sun's multimillion-degree atmosphere) and create the root of space weather. Until now, there's been some mystery surrounding how the sun's internal dynamo controls the solar cycle. Also, when observing the cycles of other stars that look like the sun in our galaxy, astronomers have noticed that the cycles are different, according to the statement. And therein lies a conundrum: If our sun is exhibiting different cyclical behavior than other sun-like stars, is our sun's cycle driven by a fundamentally different mechanism? By carrying out simulations of stellar magnetic fields, the researchers determined that a star's magnetic cycle is controlled by the relationship between luminosity and rate of rotation. This relationship is known as the "Rossby number." When plotting the luminosities and rotation rates for a selection of sun-like stars, the researchers noticed that their cycles were inversely proportional to this number. In other words, as the Rossby number increases, a star's cycle period decreases — and the sun follows this trend even though its cycle might be wildly different from those of other stars. So, the sun is just like other sun-like stars, the researchers concluded; although these stars may be different, their cycles are driven by their internal dynamos.